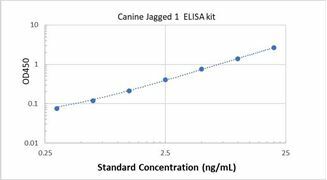 Specificity This assay has high sensitivity and excellent specificity for Canine Jagged 1. No significant cross-reactivity or Canine Jagged 1 and analogues was observed. 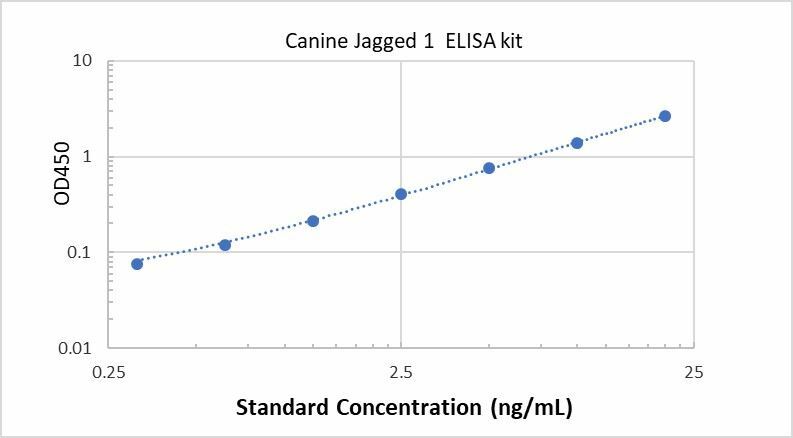 Typical Data ELISA: Canine Jagged 1 ELISA Kit (Colorimetric) These standard curves are provided for demonstration only. A standard curve should be generated for each set of samples assayed. Background Jagged1 (JAG1) is one of five cell surface proteins (ligands) that interact with 4 receptors in the mammalian Notch signaling pathway. The Notch Signaling Pathway is a highly conserved pathway that functions to establish and regulate cell fate decisions in many organ systems. Once the JAG1-NOTCH (receptor-ligand) interactions take place, a cascade of proteolytic cleavages is triggered resulting in activation of the transcription for downstream target genes. Located on human chromosome 20, the JAG1 gene is expressed in multiple organ systems in the body and causes the autosomal dominant disorder Alagille syndrome (ALGS) resulting from loss of function mutations within the gene. JAG1 has also been designated as CD339.